A couple years ago, geek merchandise outlet ThinkGeek came up with an idea for an arcade cabinet for the iPad. It was intended as an April Fools' joke, but it was so well-recieved that Ion Audio decided to make it into a real product. 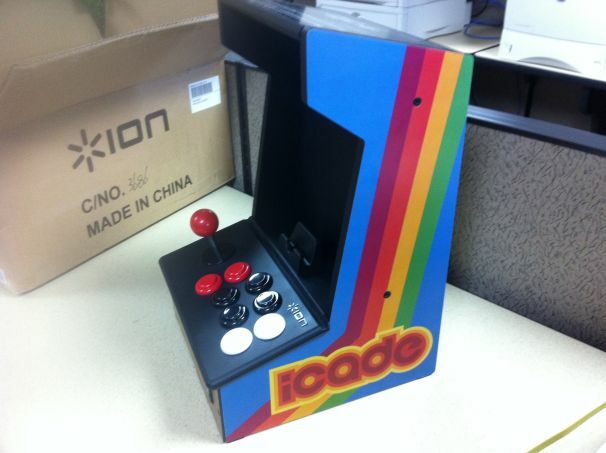 We normally don't cover a lot of gaming stuff here on GeekTech, but when we got an iCade in the office, we couldn't resist. So in honor GeekTech's Retro Week, here's what we thought of this throwback gadget. Before playtime starts, you'll have a little work to do. 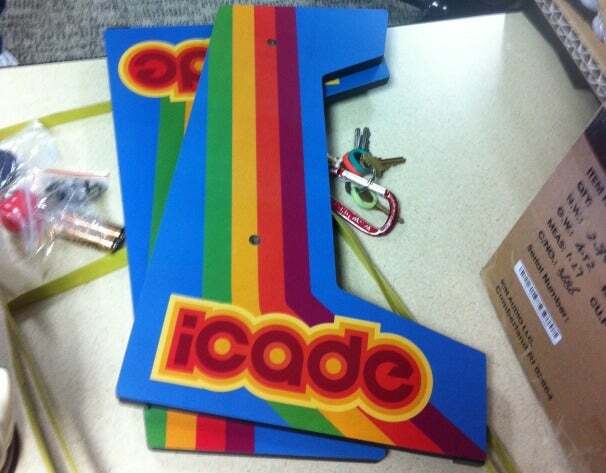 Much like products you'd purchase from Ikea, the iCade needs to be assembled first. Assembly wasn't too difficult--you're basically just sticking the parts together--but we managed to put the top cover on upside down. Oops. Once you have it all assembled, it's time to set up your iPad to work with it. The iCade connects to your iPad via Bluetooth, so in essence it's treated as a Bluetooth keyboard. This came as a bit of a surprise to us--we expected it to connect via a Dock connector--and it works a little wonky. When you pair the iCade with your iPad, you have to punch in a PIN on the iCade, but since there are no number keys, the various arcade controls translate to different numerical values. It took us a few tries to punch in the right combination, but we eventually got it to pair. Update, Aug 8, 2011: The fine folks at Think Geek wrote us to let us know that a number of other games, including Silverfish Max, Super Mega Worm, Sideways Racing, Mos Speedrun, IronStar Arena, Compression HD, and HungryMaster also work with the iCade (we have yet to test them though). Once you're all set up, it's time to play! We played Mission Command and Pong using the iCade in our hands-on time. The controls take some getting used to: They feel imprecise, especially for someone who's accustomed to playing games on an iPad. I couldn't play Mission Command to save my life with the arcade controls--I was moving all over the place and couldn't hit my targets effectively. I imagine I'd get used to it if I had more time to play with it, though. The iCade is designed for using the iPad in portrait mode; its limitations become more apparent when you play a game (like Pong) in landscape mode. While we managed to play Pong with the iCade (and it did a decent job, all things considered, for a one-player game), we had to take the iPad out of the the iCade's cradle, otherwise it wouldn't fit. Oh, and since the iPad sees the iCade as a Bluetooth keyboard, you have to actually disable Bluetooth on your iPad if you switch to another app and have to enter text; otherwise, the onscreen keyboard won't appear. At the moment, the iCade is little more than a novelty. It's a clever idea, but given it costs $99 and only works with one app, it isn't a must-have, even for hard-core gamers. If more developers get on board and write apps that can support the iCade, though, it might be worth your consideration. For more on the iCade, see Patrick Miller's take in our slideshow, The Treasures of Skymall Tested, and Alex Wawro's video walkthrough. Updated to include the video that somehow got omitted from this article.